This could be described as Walter Salles’ goal when he set out to enter the world of film-making. The Brazilian director really spearheaded the return of his countries movies on the international scene in the 1990’s. Obviously, Salles was too young to have been part of the Cinema Novo of the 60’s and 70’s... But in the 80’s he became a documentary film maker before starting on fiction in 1991 with his first film - Exposure, a fantastically crafted thriller. However, the 1990’s saw Brazil enter an enormous economic crisis, which hugely hindered Salles’ cinematic output. He claims to have survived with what little he owned that he sold to feed his own. He also made documentaries on the state of the South American continent for European TV channels. 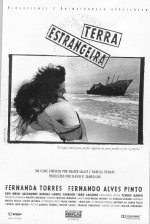 Terra Estrangeira starts off from the tragic events related to the economic crisis of the 1990’s. It seems obvious that this period has become History for Walter Salles, as the amazing story of mixing cultures unfolds in Terra Estrangeira. The plot takes place in both Brazil and Portugal, and in an unprecedented way Salles offers the world an insight into how the two cultures twirl and mix together. Paco is only a young boy, passionate about theatre, whose mother is one of the direct casualties of the humongous economic crash. Left with nothing, he feels the need to fulfill his late mother’s dream : returning to her native land, Spain. He meets an excentric character, who is taken in by the boy’s story and sends him on a courier mission to deliver a package to Portugal. From there Paco hopes to cross over to Spain. His journey unfolds as he meets Brazilian expatriates struggling in Portugal. And this is where we meet Alex who has left Brazil out of desperation - as is the case for many of these immigrants, he is barely surviving in Portugal. The touching tale speaks very justly of roots and displacement in an ever globalizing world. The globalisation process that disposes of brazilians, uprooting them from their lands and their culture as the newly elected Fernando Color froze all national savings. Even in Portugal, Brazilians feel alienated and marginalized. Alex and Paco end up desperate, fleeing from similar unknowns. The music of fado mixes with brazilian rhythms as destinies in both countries meet. Characters have an incredible beauty, expose their complexities. Filmed in black and white, the images are unpolished yet stand out by their authenticity. With Terra Estrangeira, Salles makes a first beautiful mark on the world of cinema. Central do Brazil (Central Station) tells the tale of a young boy in search of his father in the chaos of modern time Brazil while he is courageously helped by a former school teacher named Dora who will lend her comforting wings to help him in his quest. She makes money writing letters for the illiterate people who pass through the main train station of Rio de Janeiro, and this is where she meets the young and recently orphaned Josué. The film is a very touching look upon the social realities of Brazil, of the orphans it carries, of the exclusion that it allows for. Walter Salles manages to expose some of Brazil’s fatal atrocities in a few glimpses along the romanticized storyline. A brief shot of police brutality barely interrupts the story and yet awakens and engages the viewer to some of the darkest sides of Brazil. Beneath the samba and the carnival lie other unspoken beauties and hardships. And Walter Salles has raised them to International cinematic scene with great skill. Abril Despadacado (Behind the Sun in English) takes a fresh and romanticized look at the old Brazilian traditions of the Nordeste. This far back region, in the north-east of Brazil as its name indicates, is pictured brilliantly in this movie. The plot revolves around one of the areas long-standing traditions: the open revenge cycle of killing between two rural families fighting for land. However, the film is but loosely based on these “honour killings” that one might have expected from Sicily or Corsica but not South America. 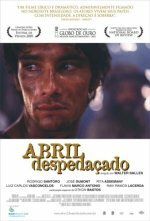 The central story around which the film gyrates tells the magnificent story of one young man (Rodrigo Santoro) who wishes to break away from tradition. Someone wishes to make peace with this generations-long cycle of death - a cycle caused by a disagreement on land between the Breves family and the Ferreiras. As a director, Salles put most of his efforts on building up an almost poetical sentiment. Salles’ artful approach allows the viewer to see rather than hear, to feel rather than be told what to feel. It is a valid comment to say of Abril Despedacado is at times slow and that the director spent perhaps too much time working on artwork and not enough on acting... But the general feeling one gets is, as much of the story unfolds and the characters are uncovered, that the spectator himself is the hunted. And, just for that, Salles remains a masterful artist. 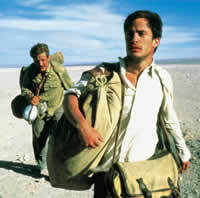 In the year 1952, two young Argentinian men set out on a long and arduous road trip. Starting off from the town of Buenos Aires, the two young men had clear objectives in mind : discover the continent of which they are a part of, Latin America. Their names : Ernesto Guevara and Alberto Granado. One of the names strikes the viewer as rather more recognised today. But both Granado and Guevara, these two middle class, white, southern Americans, played important parts in spreading and upholding the ideal of communismo in later stages of their lives. The stage is set when, at the age of 23, Guevara is still a medical student. Granado, on the other hand, is a biochemist. Setting off on their long trip, they dream of booze, of girls, of adventure. But as the scenery shown to us by Salles diversifies, so too do the protagonist’s perspectives. They encounter poverty and misery in all its shapes and forms - from the underpaid exploited miners, to the forgotten and excluded lepers. This evolution is perhaps the films most successful point - An emotionally bubbling take on two young men whose political and ethical stances are slowly, but ever so surely, forged into making the historical figure that we know of today. Diarios de Motocicleta is perhaps one of Salles’ most esthetical works to date - playing on colours and landscapes so as to take the viewer on the same trip through what he and the Che have in common, an attractive continent, but one in which inequality is still hugely predominant. The two projects Walter Salles is now working that we know of are Dark Water and a segment of Paris, Je t’Aime of which we talked in our "filmography" of Alejandro González Iñárritu. The latter film is one we are all waiting for with - let us be very clear - impatience!